One in five, or about 1.5 billion people worldwide, suffer from chronic pain (1). 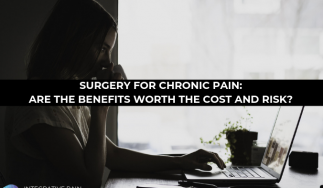 Despite recent medical advances, the efficacy of treatment for chronic pain does not match this widespread and costly demand. Analgesic medications, such as opioids, work minimally, and are not free from unwanted and serious side-effects. Surgery is recommended in select cases, but also has risks, is costly, and oftentimes cannot guarantee definitive recovery. The limitations of our modern biomedical model shouldn’t come as a surprise, when we recognize that chronic pain is defined not just by structural issues, but by psychological ones as well. A recent survey of nearly 200,000 people from 43 countries revealed that people with back pain are twice as likely to have one of five mental health conditions (depression, anxiety, stress, psychosis, and sleep deprivation) as compared to those without back pain (2). 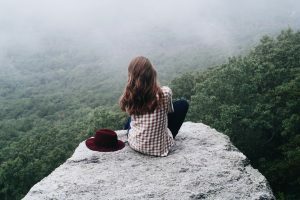 Research also showed that psychological factors such as depression, anxiety, catastrophic thinking, and fear of movement, negatively impact the outcome of musculoskeletal pain conditions, and may strongly contribute to the transition to chronic pain and disability (3). Chronic pain is largely preventable when education, physical activity and proper nutrition are made a part of daily life. Physical therapists have the extraordinary potential to address and guide prevention efforts through exercise prescription, nutrition education and lifestyle counseling. But is there anything more physical therapists can do when addressing the psychological obstacles to pain prevention and treatment? The biopsychosocial approach to pain management is embraced by individual practitioners and health centers alike. Numerous clinical trials have assessed the potential benefits of merging standard physiotherapy with psychological interventions (i.e. Psychologically Informed Physical Therapy, or PIPT) to treat chronic pain. Learn more about INTEGRATING PSYCHOLOGICAL AND BEHAVIORAL APPROACHES INTO PHYSICAL THERAPIST TREATMENT OF CHRONIC PAIN. 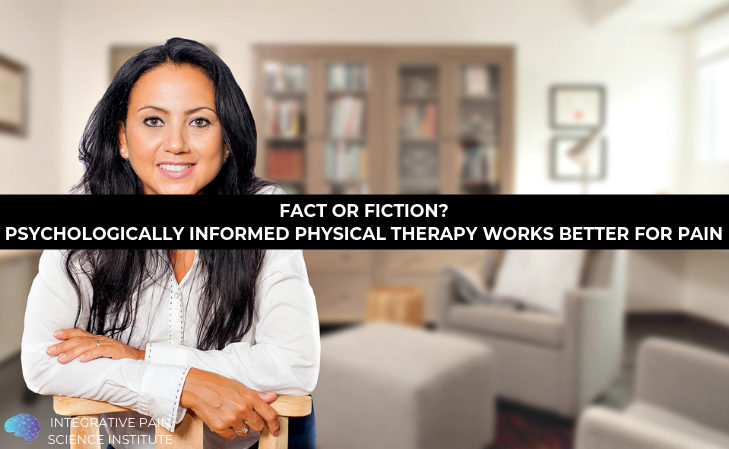 Is Psychologically Informed Physical Therapy Superior? What evidence shows that physiotherapy combined with psychological intervention (PIPT) is better than physiotherapy alone (PT) when addressing musculoskeletal pain and its associated psychological discomfort? This is the question that a group of researchers from The University of Queensland in Australia set out to answer. They pooled data from randomized controlled trials (RCTs) that compared the efficiency of PIPT versus PT alone (usual care) to treat acute or chronic musculoskeletal pain conditions. The results of their systematic review and meta-analysis were recently published in the Clinical Journal of Pain (4). To be included in the study, the psychological intervention had to be delivered (either individually or in a group setting) by a physical therapist who had been trained by a psychologist or by another competent health professional. Psychological interventions included cognitive-behavioral techniques, stress management, relaxation training, hypnosis, mindfulness. acceptance-based interventions, coping skills training, problem-solving, systematic desensitization, motivational interviewing, and anxiety and depression interventions. The prevailing pain conditions were low back pain (LBP), neck pain, whiplash-associated disorders (WAD), osteoarthritis (OA), and temporomandibular joint syndrome. Conditions such as migraines, fibromyalgia, rheumatoid arthritis, and headaches were not included. The meta-analysis evaluated pain intensity and disability as primary pain-related outcomes, and self-efficacy, fear-avoidance/kinesiophobia, pain catastrophizing, depression, and anxiety as psychological outcomes. 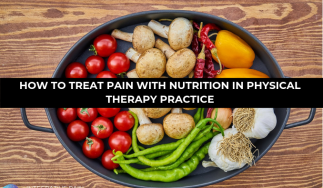 The multi-study analysis showed that for all pain conditions, PIPT had modest, but significantly greater benefits than PT alone in lessening pain and improving psychological outcomes. Specifically, the analysis found that pain at short term (4-6 weeks) and long term (26-52 weeks) follow-ups decreased, as did short term disability, when psychological interventions were delivered. Also improved was self efficacy (short and long term), fear of movement (short term), pain catastrophizing (short and long term), depression (short term). Interestingly, most studies with a larger effect size, where the benefits of the intervention were greater, offered personalized treatment. These studies addressed maladaptive cognitions and behaviors through various cognitive techniques (eg, CBT) and behavioral strategies (eg, breathing and relaxing techniques, goal setting, and graded activities) (5, 6). In contrast, most studies showing a small effect size did not explicitly address patients’ maladaptive cognitions, and interventions tended to have a strong behavioral focus instead. 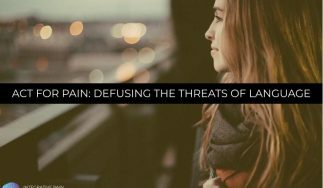 To learn how CBT can help physical therapists address pain catastrophizing, check out my blog, TOP 3 METHODS TO TARGET PAIN CATASTROPHIZING. To appreciate the limitations of analyses like this, which combine the results of multiple studies, it is informative to look at those that showed better results when standard physiotherapy was delivered without any other therapeutic component. One of these was a recent RCT involving people with nonspecific low back pain that were randomized to receive either traditional physiotherapy care or a Shared Decision-Making (SDM) physiotherapy care package that asked them to choose between 4 treatment modalities, CBT among them. While the study did not measure specific outcomes of the CBT group, results showed higher patient satisfaction with standard care (PT alone), and even suggested that SDM was harmful (7). This study, which was included in the meta-analysis comparing PT + PI vs PT alone, gives a good idea of the heterogeneity that is usually found when attempting to define the success of a given treatment by drawing data from multiple, varied experimental settings. The study’s findings agree with those of a recent meta-analysis of multidisciplinary biopsychosocial rehabilitation for LBP (8), suggesting that physiotherapist-delivered psychological treatment is a useful way to manage musculoskeletal pain. To learn more about how PIPT can help reduce musculoskeletal pain, read my blog, HOW PSYCHOLOGICALLY INFORMED PHYSICAL THERAPY (PIPT) IMPROVES MUSCULOSKELETAL OUTCOMES. Because each client is unique, addressing psychological obstacles in chronic pain treatment will always remain a challenge and priority. How can we make this challenge less demanding? 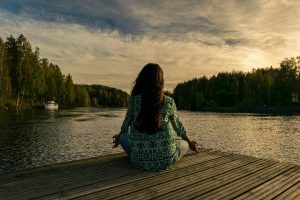 Becoming familiar with the various approaches available, such as CBT, ACT, mindfulness, mindfulness-based stress reduction and pain education, are essential. Just as important is understanding your client’s priorities, values, fears, and openness and willingness to explore their pain. Lastly, dedication and enthusiasm in delivering psychological support will guarantee fluid communication, mutual trust, and the opening of new doors to treatment success. 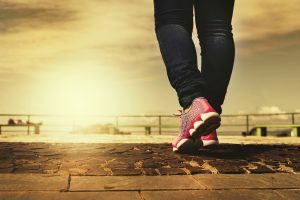 Acceptance and Commitment Therapy is an evidence-based treatment for pain that helps clients drop the struggle, and focus on moving forwards with the activities they value. To learn more about ACT for Pain and training for practitioners, click here! 1- Goldberg, D. S., & McGee, S. J. (2011). Pain as a global public health priority. BMC public health, 11(1), 770. 2-Stubbs, B., Koyanagi, A., Thompson, T., Veronese, N., Carvalho, A. F., Solomi, M., … & Vancampfort, D. (2016). The epidemiology of back pain and its relationship with depression, psychosis, anxiety, sleep disturbances, and stress sensitivity: Data from 43 low-and middle-income countries. General hospital psychiatry, 43, 63-70. 3- Edwards, R. R., Dworkin, R. H., Sullivan, M. D., Turk, D. C., & Wasan, A. D. (2016). The role of psychosocial processes in the development and maintenance of chronic pain. The Journal of Pain, 17(9), T70-T92. 4- Silva Guerrero, A. V., Maujean, A., Campbell, L., & Sterling, M. (2018). A systematic review and meta-analysis of the effectiveness of psychological interventions delivered by physiotherapists on pain, disability and psychological outcomes in musculoskeletal pain conditions. The Clinical journal of pain, 34(9), 838-857. 5- Bring, A., Åsenlöf, P., & Söderlund, A. (2016). What is the comparative effectiveness of current standard treatment, against an individually tailored behavioural programme delivered either on the Internet or face-to-face for people with acute whiplash associated disorder? A randomized controlled trial. Clinical rehabilitation, 30(5), 441-453. 6- Vibe Fersum, K., O’Sullivan, P., Skouen, J. S., Smith, A., & Kvåle, A. (2013). Efficacy of classification‐based cognitive functional therapy in patients with non‐specific chronic low back pain: A randomized controlled trial. European journal of pain, 17(6), 916-928. 7- Patel, S., Ngunjiri, A., Hee, S. W., Yang, Y., Brown, S., Friede, T., … & Tysall, C. (2014). Primum non nocere: shared informed decision making in low back pain–a pilot cluster randomised trial. BMC musculoskeletal disorders, 15(1), 282. 8-Kamper, S. J., Apeldoorn, A. T., Chiarotto, A., Smeets, R. J. E. M., Ostelo, R. W. J. G., Guzman, J., & Van Tulder, M. W. (2015). Multidisciplinary biopsychosocial rehabilitation for chronic low back pain: Cochrane systematic review and meta-analysis. Bmj, 350, h444.